How Far Would You Go... A Million Miles? There aren't many certainties in this life, but one thing I know for sure is that when your child is sick, fighting a life-threatening illness, as a parent, you would do anything to cure them. You would trade places with them in a heartbeat, you would give your life for theirs, you would travel to the ends of the earth (and back) to find them the treatment they needed, and most certainly, you would go a million miles if it meant that the cure was at the end. 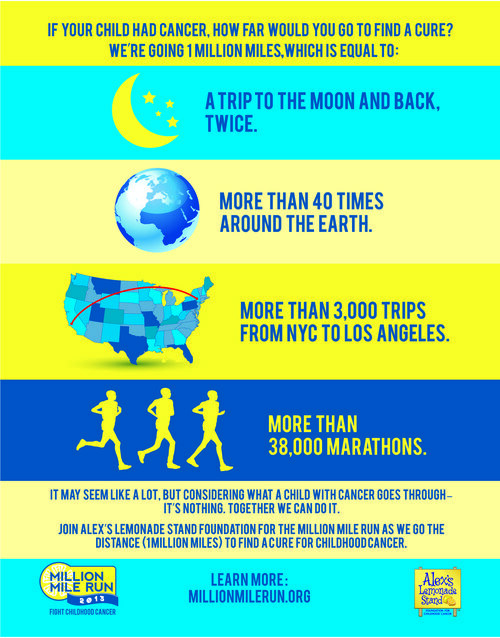 This September, during National Childhood Cancer Awareness Month, we invite you to help us prove that fact by participating in the first ever worldwide Million Mile Run. As a parent (and an extreme athlete), I know I'd walk (or probably run!) a million miles to find cures for kids with cancer, but as my daughter knew, goals this ambitious cannot be reached alone! Instead, we are on a mission to walk/run one million miles collectively in the month of September. When my daughter Alex was eight-years-old and nearing what would be the end of her life, she told a reporter that she wanted to raise a million dollars through her lemonade stand in 2004. As children often do, we thought she was exaggerating, but when we asked her how she would accomplish such a feat, it was simple -- if others would help, together it was possible. So, there, the groundwork was laid for what would become Alex's Lemonade Stand Foundation. Alex would reach her million dollar goal, and now, nearly 10 years after she lost her life to the disease, we will return to her ambition, by challenging the country and world to complete one million miles, and then some, all to help kids with cancer. I know what you're thinking -- that's crazy! You might be right, but as a parent who lost their child to cancer almost a decade ago, what I find crazy and unacceptable is the fact that children are still dying today from the disease. We should be appalled at the number of children who lose their lives to cancer. To give you a snapshot, in just one year, over 2,000 children will die from cancer, that's more than five children a day, and that is only in the United States. Let's put an end to this now, and not only raise funds for childhood cancer in the process, but bring September to the same level of visibility that October has garnered for Breast Cancer Awareness. So, exactly how many miles do you need to walk to help us reach our goal -- as many as you can! We are hoping to recruit at least 10,000 people, and if we all walk/run 100 miles over the course of the month of September, we'll get there. Sounds like too many miles for you? That's ok, why not form a team instead? A team of four can walk one mile at lunch every day and they'll easily reach 100 miles! Will you join us? If your child was sick, how far would you go to find a cure? A million miles?